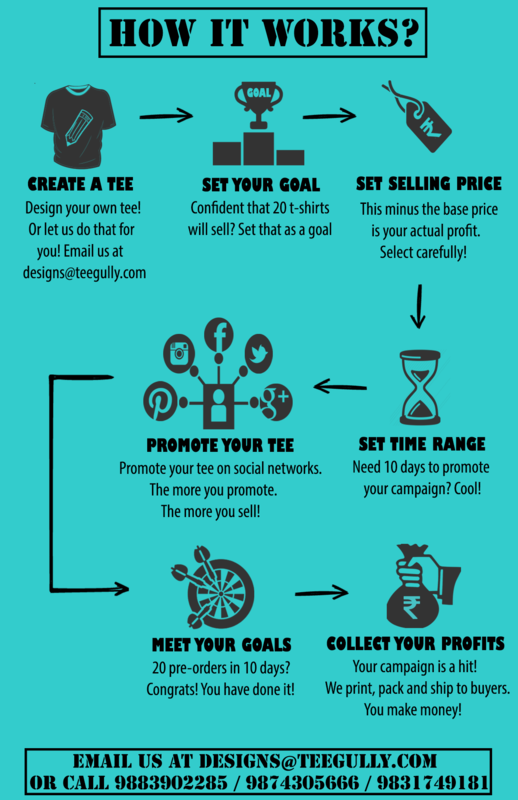 Teegully is a online platform where you can crowdfund your awesome custom t-shirt designs! You can use Teegully to launch a campaign for crowdfunding your custom t-shirt design. You can also set your selling price and decide the running time for your campaign! Promote the t-shirt to your audience and make the campaign a huge success. Teegully takes care of the manufacturing, printing, packing and shipping of the t-shirts! You sit back and earn a lot of money! Hassle free, isn't it? How can I start a campaign on Teegully? -- Attach your custom design in either of the following formats - png, psd. The resolution of the image must be 300 dpi. Also try to keep the background of the image transparent! 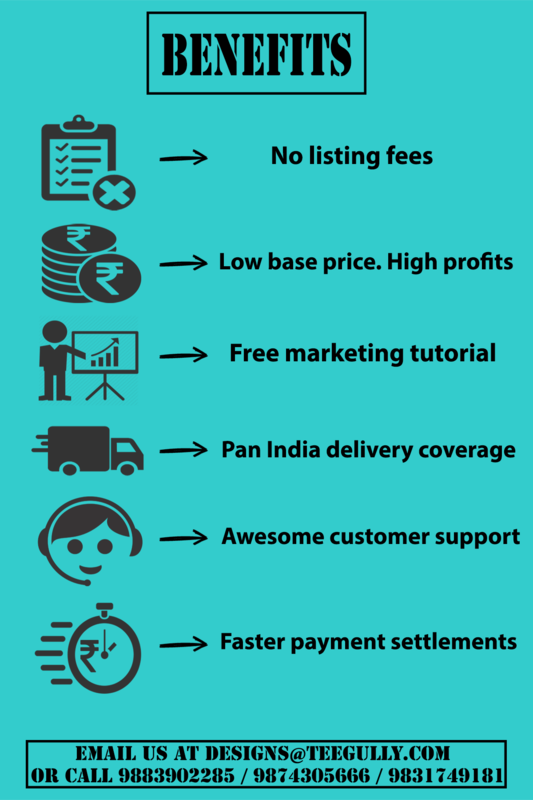 -- Mention the following - your selling price, the running time of the campaign and your minimum campaign goal i.e. the minimum number of t-shirts that you want to sell through your campaign! -- Mention your mobile number so that we can contact you in case of any discrepancies! After getting your email, we'll get back to you with the custom t-shirt design mockup for approval within 2 days. After you approve the mockup, we'll register you on our website as a campaigner and put up your custom t-shirt design mockup on Teegully and share the link with you so that you can start promoting among your audience and start racking up sales! Can I get help from Teegully for designing artwork? Yes! You can email us at designs@teegully.com stating your requirements and our in-house design team will surely help you out! You see, we want even people who don't know how to create digital artwork to use our platform and earn money! In the end, it's all about the design ideas that would sell to a specific audience! For how many days will my campaign run? You have to decide how many days it would take for you to achieve your minimum sales target. If you think you can sell 20 t-shirts in 10 days, then set that as your campaign running period! Can I set my own target when I start a campaign? The minimum sales target set by teegully.com is 10. If you think your artwork can sell more than 10 t-shirts, then set that as your campaign target! How will I know the number of t-shirts sold in my campaign? The number of tshirts sold will be displayed in your product page. What happens if my campaign fails to reach its target? If your campaign fails to reach target then we will consider it as an unsuccessful campaign and we will not print your artwork. 10-15 days after the successful completion of your campaign, we will make the payment via online transfer or cheque or demand draft. How does Teegully make money out of this? We charge very little for per tshirt we print. That charge is included in the base price of tshirt. Will the copyright of the artwork remain with me? We will create your profile with information about you and you will be displayed as artist of the product in your product page. People can browse through your artist profile to see more designs of yours. In case of infringement of copyright by any other campaign on Teegully, how do I lodge a complaint? If you find any such infringement of copyright, write us at designs@teegully.com. We will immediately look into it. Will my campaign be taken down by Teegully? If we feel the campaign is not meeting the Terms & Conditions of Teegully.com, we will bring down your campaign. How to start a campaign on Teegully? What can you campaign for at Teegully? Some ideas to get you rolling!